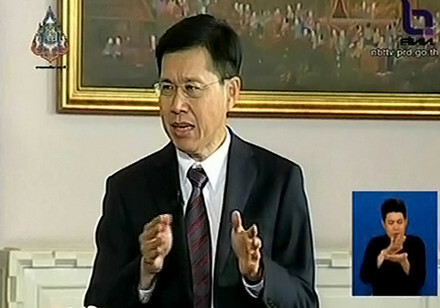 The Education Minister appeared on the Prime Minister’s weekly talkshow to clarify plans to close small schools. Prime Minister Yingluck Shinawatra tasked Deputy Prime Minister and Education Minister Pongthep Thepkanchana (พงศ์เทพ เทพกาญจนา) to appear on the “Yingluck Government Meets the People” weekly talkshow on NBT. Mr. Pongthep talked about the proposal to close schools with less than 60 students, adding that it can only be carried out with approval from people in the area and the students and staff. He said students from the closed schools will be moved to study at their nearest school, and transportation, possibly in the form of bicycles, will be provided for them to lessen their burden of travel.